The United States Centers for Disease Control provide updated guidelines and travel recommendations for the prevention and treatment of malaria in different parts of the world. Discuss the most recent information with your doctor before traveling to areas where malaria occurs. Chloroquine is also used to treat infection caused by a different type of parasite (ameba) by killing the ameba. Take this medication by mouth, usually with food to prevent stomach upset, exactly as directed by your doctor. Daily or weekly dosing, dosage amount, and length of treatment are based on your medical condition, on whether you are preventing or treating the illness, and your response to treatment. The dosage in children is also based on weight. To prevent malaria, take chloroquine once weekly on the same day each week, or as directed by your doctor. Start this medication usually 1 to 2 weeks before you enter the malarious area, continue to take it weekly while in the area, and weekly for 4 to 8 weeks after leaving the area, or as directed by your doctor. Mark your calendar or travel schedule with a reminder to help you remember. To treat malaria infection or an ameba infection, follow your doctor's instructions. Take this medication 4 hours before or after taking a certain drug for diarrhea (kaolin) or taking antacids (such as magnesium/aluminum hydroxide). These products may bind with chloroquine, preventing your body from fully absorbing the drug. It is very important to continue taking this medication exactly as prescribed by your doctor. Do not take more or less of this drug than prescribed. Do not stop taking it before completing treatment, even if you feel better, unless directed to do so by your doctor. Skipping or changing your dose without approval from your doctor may cause prevention/treatment to be ineffective, cause the amount of parasite to increase, make the infection more difficult to treat (resistant), or worsen side effects. It is important to prevent mosquito bites (such as by using appropriate insect repellents, wearing clothes that cover most of the body, remaining in air-conditioned or well-screened areas, using mosquito nets and insect-killing spray). Buy insect repellent before traveling. The most effective insect repellents contain diethyltoluamide (DEET). Ask your doctor or pharmacist to recommend the appropriate strengths of mosquito repellent for you/your children. No drug treatment is completely effective in preventing malaria. Therefore, seek immediate medical attention if you develop symptoms of malaria (such as fever, chills, headache, other flu-like symptoms), especially while in the malarious area and for 2 months after completing this prescription. Quick treatment of malaria infection is needed to prevent serious, possibly fatal, outcomes. When using chloroquine for treatment of malaria, tell your doctor if your condition persists or worsens. What conditions does Chloroquine Phosphate treat? Blurred vision, nausea, vomiting, abdominal cramps, headache, and diarrhea may occur. If any of these effects persist or worsen, tell your doctor or pharmacist promptly. Tell your doctor right away if you have any serious side effects, including: bleaching of hair color, hair loss, mental/mood changes (such as confusion, personality changes, unusual thoughts/behavior, depression), hearing changes (such as ringing in the ears, hearing loss), darkening of skin/tissue inside the mouth, worsening of skin conditions (such as dermatitis, psoriasis), signs of serious infection (such as high fever, severe chills, persistent sore throat), unusual tiredness, swelling legs/ankles, shortness of breath, pale lips/nails/skin, signs of liver disease (such as severe stomach/abdominal pain, yellowing eyes/skin, dark urine), easy bruising/bleeding, muscle weakness, unwanted/uncontrolled movements (including tongue and face twitching). This medication may rarely cause low blood sugar (hypoglycemia). Tell your doctor right away if you develop symptoms of low blood sugar, such as sudden sweating, shaking, hunger, blurred vision, dizziness, or tingling hands/feet. If you have diabetes, be sure to check your blood sugars regularly. Your doctor may need to adjust your diabetes medication. Get medical help right away if you have any very serious side effects, including: severe dizziness, fainting, fast/slow/irregular heartbeat, seizures. This medication may cause serious eye/vision problems. The risk for these side effects is increased with long-term use of this medication (over weeks to years) and with taking this medication in high doses. Get medical help right away if you have any symptoms of serious eye problems, including: severe vision changes (such as light flashes/streaks, difficulty reading, complete blindness). List Chloroquine Phosphate side effects by likelihood and severity. Before taking chloroquine, tell your doctor or pharmacist if you are allergic to it; or to hydroxychloroquine; or if you have any other allergies. This product may contain inactive ingredients, which can cause allergic reactions or other problems. Talk to your pharmacist for more details. Before using this medication, tell your doctor or pharmacist your medical history, especially of: a certain enzyme problem (glucose-6-phosphate dehydrogenase deficiency-G6PD), vision/eye problems, hearing problems, kidney disease, liver disease, regular alcohol use/abuse, psoriasis, a certain blood disorder (porphyria), seizures. This drug may blur your vision or rarely make you dizzy. Alcohol or marijuana can make you more dizzy. Do not drive, use machinery, or do anything that needs alertness or clear vision until you can do it safely. Avoid alcoholic beverages. Talk to your doctor if you are using marijuana. Chloroquine may cause a condition that affects the heart rhythm (QT prolongation). QT prolongation can rarely cause serious (rarely fatal) fast/irregular heartbeat and other symptoms (such as severe dizziness, fainting) that need medical attention right away. The risk of QT prolongation may be increased if you have certain medical conditions or are taking other drugs that may cause QT prolongation. Before using chloroquine, tell your doctor or pharmacist of all the drugs you take and if you have any of the following conditions: certain heart problems (heart failure, slow heartbeat, QT prolongation in the EKG), family history of certain heart problems (QT prolongation in the EKG, sudden cardiac death). Low levels of potassium or magnesium in the blood may also increase your risk of QT prolongation. This risk may increase if you use certain drugs (such as diuretics/"water pills") or if you have conditions such as severe sweating, diarrhea, or vomiting. Talk to your doctor about using chloroquine safely. Older adults may be more sensitive to the side effects of this drug, especially eye/vision problems and QT prolongation (see above). During pregnancy, this medication should be used only when clearly needed. It may harm an unborn baby. While you are pregnant, traveling to an area with malaria places you and your infant at much higher risk of death and other problems. Discuss the risks and benefits of malaria prevention with your doctor. What should I know regarding pregnancy, nursing and administering Chloroquine Phosphate to children or the elderly? Some products that may interact with this drug include: agalsidase, mefloquine, penicillamine, sulfadoxine/pyrimethamine, products that may harm the liver (such as acetaminophen, isoniazid, alcohol). This medication can speed up or slow down the removal of other medications from your body, which may affect how they work. An example of an affected drug is praziquantel, among others. Many drugs besides chloroquine may affect the heart rhythm (QT prolongation), including amiodarone, dofetilide, mefloquine, pimozide, procainamide, quinidine, sotalol, macrolide antibiotics (such as erythromycin), among others. Therefore, before using chloroquine, report all medications you are currently using to your doctor or pharmacist. Cimetidine is a nonprescription drug that is commonly used to treat extra stomach acid. Because cimetidine and other antacids may interact with chloroquine, ask your pharmacist about other products to treat extra stomach acid. Take chloroquine at least 2 hours before or after taking ampicillin. Chloroquine may decrease the amount of ampicillin in your body and the ampicillin may not work as well. Certain vaccines (rabies vaccine, cholera vaccine) may not work as well if given while you are taking chloroquine. Ask your doctor for more details. Does Chloroquine Phosphate interact with other medications? If someone has overdosed and has serious symptoms such as passing out or trouble breathing, call 911. Otherwise, call a poison control center right away. US residents can call their local poison control center at 1-800-222-1222. Canada residents can call a provincial poison control center. Symptoms of overdose may include: fast/irregular heartbeat, fainting, slow/shallow breathing, unwanted/uncontrolled movements (including tongue and face twitching), seizures, inability to wake up (coma). Laboratory and/or medical tests (such as eye exams, reflex tests, liver tests, EKG, complete blood counts) should be performed periodically to monitor your progress or check for side effects if you are taking chloroquine for long periods. Consult your doctor for more details. 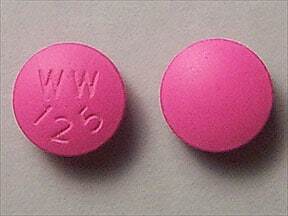 This medicine is a pink, round, coated, tablet imprinted with "WW 125". 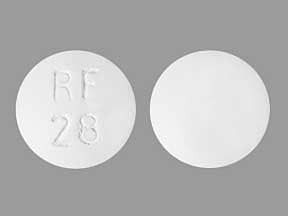 This medicine is a white, round, film-coated, tablet imprinted with "RF 28". 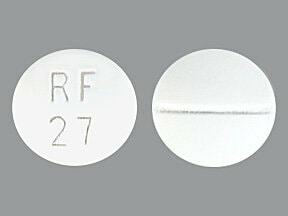 This medicine is a white, round, scored, film-coated, tablet imprinted with "RF 27". This medicine is a white, round, scored, tablet imprinted with "CN 250". 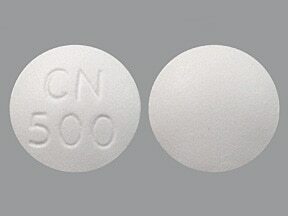 This medicine is a white, round, film-coated, tablet imprinted with "CN 500". Are you taking Chloroquine Phosphate? Are you considering switching to Chloroquine Phosphate? How long have you been taking Chloroquine Phosphate?